Their undeniable talent, their rich technical skills, their flair for showmanship in their garish marching outfits, black-rimmed glasses and dark toupées, and the way they complemented one another at the keyboards prompted critics to refer to them as “The Grand Twins of the Twin Grands”—a one-of-a-kind (or more precisely, two-of-a-kind) act of unparalleled popularity. 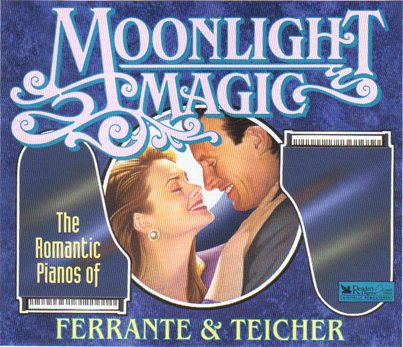 The early years were note financially rewarding for Ferrante & Teicher, but the pair slowly developed a following. Utilizing devices to alter the natural tone of the piano, they could produce a range of instrumental sounds from banjo to drums to harpsichord. However, they chose to keep their day jobs teaching piano at Juilliard and limit their concertizing to weekends. In the early ‘50s, they began recording duo-piano arrangements for Columbia Records and Westminster, and made radio and television appearances with Percy Faith on CBS’s Woolworth Hour, ABC’s Piano Playhouse and the Ed Sullivan, Dinah Shore and Steve Allen shows. In 1959, Ferrante & Teicher were approached by producer-arranger Don Costa, who put them together with United Artists Records. They entered a recording studio with a 46-piece orchestra, and the result was the instantly successful “Theme from The Apartment.” Within its first three weeks, it sold more than 750,000 copies. “Exodus,” which followed, went to No. 2 on the pop charts in 1961—their all-time biggest hit. Those and subsequent recordings earned them the label of the “Movie Theme Team.” Their 1961 album West Side Story and Other Motion Picture and Broadway Hits was their biggest-selling LP and remained on the charts for almost a year. Over a 40-year period, Ferrante & Teicher gave more than 4,600 concerts before four million people and recorded nearly 200 albums. Lou Teicher retired in 1988, but Art Ferrante continues to record occasionally. Their personal relationship still flourishes: they and their families live near each other in Sarasota, Florida. The duo has been praised for playing like “one man with four hands.” With their seemingly telepathic interplay, they had a knack for creating something new and refreshing from even the most familiar material. This Reader’s Digest collection of 60 of their greatest hits and finest performances illustrates why they still reign as the undisputed kings of the duo-piano. 3-CD, 60-track Reader's Digest compilation. It was released in both USA and Canada (with different back cover graphics) and a 32 page booklet of program notes.